Investigators have so far found no evidence of any fault with the braking system or the track on the Croydon Tram network, following the crash last week that claimed seven lives. 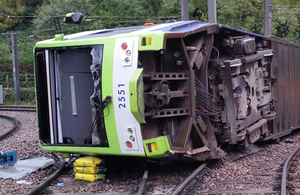 The tram was found to have braked before it approached the bend on which it derailed but still reached the turn at nearly four times the permitted speed. The Rail Accident Investigation Branch (RAIB) has published an interim report into the accident, which it is still investigating, and has issued urgent safety advice asking operators to reduce the risk of trams approaching the junction too fast. The report confirms that the tram derailed and overturned at about 6:07am last Wednesday on a curve as it approached Sandilands Junction. It then travelled around 25 metres on its side before stopping. The RAIB said its initial review of the on-tram data recorder (OTDR) showed that the tram was travelling at a speed of approximately 43.5 mph as it entered the curve, which had a speed limit of 12.5 mph. According to the report, the RAIB’s initial investigation has not indicated any malfunction of the tram’s braking system. It says early analysis of the OTDR indicated that some braking was applied in the 180 metres before the 12.5 mph speed restriction board, but this was only sufficient to reduce the tram’s speed from 50 mph to approximately 43.5 mph by the time the tram passed the board. The RAIB said at this stage it has found no evidence of any track defects, or obstructions on the track, that could have contributed to the derailment. It added that until the factors that led to the over-speeding are better understood, and before the junction re-opens, it was advising TFL’s London Trams and operator Tram Operations Ltd ‘to jointly take measures to reduce the risk of trams approaching Sandilands Junction from the direction of New Addington at an excessive speed’. Options should include a further speed restriction before the start of the existing speed limit around the curve and/ or additional operational signs. He added the group was cooperating with the investigation and passing on RAIB advice to its staff. The RAIB said its full investigation report would include ‘recommendations to reduce the likelihood and/or consequence of similar events occurring in the future’. Seven people suffered fatal injuries in the accident while 51 others were taken to hospital, with eight of them suffering injuries described as ‘serious or life-threatening’.